More than just a cartoon? Trying to explain why an animated horse is leading the way in bringing the mental health conversation into mainstream media seems mad. But here I am doing it anyway. The idea of an emotionally troubled, alcohol-reliant protagonist has been told a thousand times. As far as I’m aware, it’s never been done so using the character of a middle-aged horse. In all honesty, the generic storyline runs the dangerous risk of being exhausted. Yet Bojack Horseman offers one of the most brutal, heart-wrenching glimpses into a character, struggling with his demons and sabotaging his personal relationships. One that is told in a tragically refreshing way. Bojack on the whole, is generally awful to everyone around him. He does his best for us to despise him. Yet time and time again, we find ourselves gravitating towards him. Even sympathising with him. Though few and far between, Bojack’s good moments leave us urging him to be better. Beckoning us in with a shred of hope that there could be a happy ending. Only for him to self-destruct once more. It’s a sentiment that’s perfectly summarised by Bojack’s best friend and occasional roommate, Tod Chavez. His character is one of the few throughout the series that manages to always see good in Bojack. So when he is finally pushed beyond the line, it makes for one of the standout moments in the show. “You can’t keep doing sh*tty things and then feel bad about yourself like that makes it ok. You need to be better” he pleads with his friend. His exasperated “f*ck man, what else is there to say?” weirdly hits way harder than any of your favourite character movie deaths. It’s an unusual phenomenon, to feel so connected to these animated characters. Perhaps it’s that escapism that those struggling with mental health so often seek, that offers viewers a kind of solace. That balance of emotional connection and something that doesn’t need to be taken so seriously. Recently I read a fantastic article on Vice, that discusses how animation handles these feelings better than live-action ever could. With Bojack being the prime example behind the idea. That article summarises that “BoJack Horseman is one of many cartoons that capture something deeply realistic about depression precisely because their environments are not.” Which pretty much hits the nail on the head, takes on depression don’t have to be dark and dreary. The show is so ridiculous, in fact it’s hilarious, at times side-splittingly funny. That comedy only accentuates the darker moments though, making them that bit more crippling when they do come along. And believe me, they will cripple you. Perhaps that’s the most accurate metaphor for someone struggling with depression. In my own experience, most of the time things can be fine, though it’s tough to escape the mindset that your next low moment is only round the corner. It looms over you even when it’s not necessarily there. 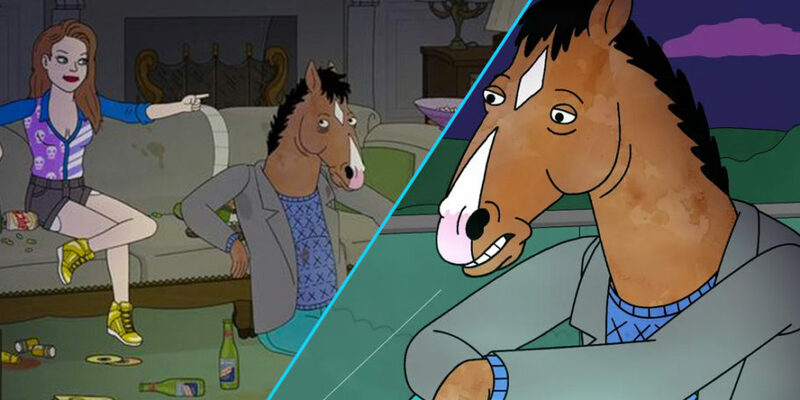 Five seasons later and Bojack Horseman has tackled a range of tough storylines. Alcoholism, drug abuse, sexual abuse, grief, depression and an utterly heartbreaking take on dementia. The show’s take on the deteriorating health of Bojack’s mother is arguably one of the most heartbreaking storylines I’ve seen in any program. The sequence which features Beatrice Horseman glaring at a cartoonist scribble whenever she tries to remember a person, offers a simple yet vastly bleak take on another tough topic. Obviously Netflix haven’t made light of mental health problems in the show by any means. Rather, offered a more accessible take on a subject we still struggle to approach as a society. Despite making inroads into encouraging these important, often life-saving conversations, we’ve hardly scraped the surface. We don’t have to explain the power of television. We still idolise and obsess over our favourite shows and actors, even if that actor is a cartoon horse. If we see these discussing such topics openly, surely that can only be a good thing? On more than one occasion I’ve seen people sharing snippets of Bojack Horseman on social media. People I didn’t realise I even followed, openly praising and relating to the show’s storylines. Maybe it’s down to the largely comedic nature of the series, maybe it’s down to our changing attitudes towards mental health as a society. Would they have done that before the show? Who knows. The important thing is that they’re doing it now and the show is playing a clear part in that.